Please click the image on right to see the Plan Sponsor Gateway. This is a live demo, with updated and current mutual fund prices. 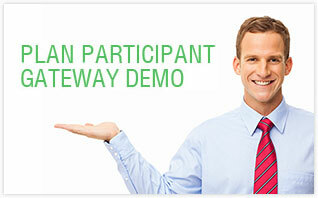 This Gateway gives the plan sponsor a solid “hands-on” experience of how robust and well-organized 401k Easy really is. Most plans can be fully administered in only 10 minutes a month...or less. The plan sponsor has complete control over all plan operations---and can view participants' accounts, easily process loan, hardship and distribution requests, print timely audit reports, and perform compliance testing, and all other functions quickly, easily, and with total confidence using 401k Easy's intuitive, proven, rock-solid administration. Entrance into your 401k Easy plan administration and participation occurs, respectively, through your customized Plan Sponsor Gateway and Plan Participant Gateway. Configure Client - Allows authorized user(s) to view and edit the company name, address, tax ID number(s), etc. to be associated with the selected plan (you can run more than one type of retirement plan via 401k Easy; contact us for details) as well as to establish the log-in names and passwords authorizing entry to the plan's day-to-day administration functions. Configure Bulletins - Enables authorized user(s) to create Bulletins that will be visible by each employee as they log into the system. Configure Divisions - Enables authorized user(s) to create and modify Divisions to attach to employee data. Common Division categories include branch office locations and company departments (accounting, marketing, etc.). Configure Employees - Enables authorized user(s) to add, delete, or modify data relating to company employees. Data can be displayed in terms of any of a variety of data fields, including established Divisions. Plans - Lets you view and edit (as appropriate) a list of your company's existing plan(s) (you can use 401k Easy to run more than one retirement plan) and to model a new plan, if desired, for approval submission. Transaction Log - Displays a list of transactions for the currently selected plan as well as the status of each transaction (pending, held, settled, etc.). Participants - Leads into the main participant activity functions for the selected plan. The initial panel displays a list of plan participants and links to the Plan Participant Gateway for access to direct management of employees' accounts, including loan, transfer, and distribution activity. Investments - Displays the investments currently offered within the selected plan. 401k Easy allows for no-load and/or load mutual funds (including no-load institutional mutual funds), self-directed brokerage accounts, annuities, and more. In fact, if the IRS says it's OK for 401k investment, it's likely compatible with 401k Easy. Visit our Investments page for details. Process Contributions - Allows the people your company authorizes to process regular as well as "special" 401k contributions, such as transfers from a previous employer's 401k plan. Contribution payroll information can be uploaded from a text file directly into the processing grid. The system will perform automatic validation checking and report any errors or rule violations encountered in the data. Participant Loans, Transfers, and Distributions - Accessed through the Plan Participant Gateway, the Loans, Transfers and Distributions panel displays a list of pending loan, distribution, and transfer requests submitted by plan participants. Authorized plan administration user(s) can approve or deny the requests, and can also model new loans, distributions, and transfers for plan participants. Activity - Accessed through the Plan Participant Gateway, the Activity panel displays a detailed list of buy/sell activity for all participants of the selected plan. Data can be filtered by date range, participant, investment name, and source. If you like, try out some or all of these functions using our demo Plan Sponsor Gateway, which is accessible through our Product Demos section. The Global Audit Log - maintains a record of ALL activity performed throughout the system, including activities at the general system administration level. Sponsor can search for information by client, plan, date range, plan administrator, participant, and/or transaction type. 128-Bit Encryption Security - Encryption helps protect private financial information as it travels over the Internet communications between the browser on the user's computer. Data is scrambled with 128 bit encryption security, then de-scrambled when it arrives back into the user's computer web browser. Confidential Log-in - Account information is accessible only with a valid log-in and PIN or password. Users who do not successfully enter login and password are locked-out after a few attempts. Automatic Log-off - The system terminates the user session if computer remains inactive for a designated period of time. This log-off feature helps prevent on-lookers from accessing confidential information if the user steps away from the computer. User Activity Reports + Logs - The system records all successful and unsuccessful sign-on, monitors all activity, including unusual activity or discrepancies in user sign-on, and locks out users who do not correctly enter the registered login and password for the account, whether that account be a participant account or the administration account. Please click the image on right to see the Plan Participant Gateway. This is a live demo, with updated and current mutual fund prices. This Gateway gives you a solid “hands-on” experience of what your employees will use to manage their 401k investments online. participants can review past and current investments, change their investment line-up, apply for a loan, hardship, or in-service distribution, update beneficiary and other personal information, change their password, send the plan sponsor a confidential email, and download and print-out a current statement. 401k Easy empowers plan participants to serve themselves to their 401k account activity and information, which they can do at any time, day or night, from any location connected to the Internet. 401k Easy self-service plan participation gives eligible employees on-the-spot access to enrolling in the plan, updating personal information, making and updating investment designations, viewing and printing activity reports and account statements, and 401k loan, transfer and distribution modeling and submissions, among other things. 401k Easy creates a home page for each plan participant. Upon login, the participant arrives at his or her home page. As plan sponsor, you can have 401k Easy display certain categories of information on each participant's home page, for instance, the participant's investment designations, account balances, and/or recent account activity. Plan participants, after logging into their customized section of your 401k plan's Plan Participant Gateway, can update their personal information themselves, online, at their leisure. Participants can amend their address, telephone number(s), disbursement preferences, passwords, and more. 401k Easy immediately notifies your designated plan administrator via e-mail of any changes. All investment and salary deferral designations are restricted within 401k Easy by rates allowable under the current federal law. During the modeling process, 401k Easy calculates the availability of funds based on money sources, aged buckets (if applicable), and other applicable rules. 401k Easy gathers all the information the 401k plan administrator needs to approve or deny an application. You can elect to have 401k Easy automatically decline any new submissions for loans, transfers or distributions if an application for such from the employee is already in the system as pending approval of your plan administrator. This works as a safeguard against plan participants flooding the system with applications for the same transaction while the plan administrator awaits, for instance, consent of spouse approval. The system houses a log of each employee's user name, password and three questions/answers within the Plan Sponsor Gateway. Plan participants can request help from your 401k plan administrator (via the 401k Easy, in person, by phone, etc.) at any time. 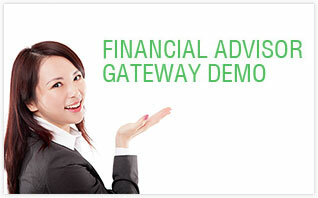 Please click the image on right to see the Financial Advisor Gateway. This is a live demo, with updated and current mutual fund prices. This Gateway gives financial advisors a solid “hands-on” experience of how robust and well-organized 401k Easy really is. Most plans can be fully administered in only 10 minutes a month...or less. The financial advisor gets an excellent “birds-eye” view of all Plan Participants' past and current investments and balances, and can also monitor the operations performed by the Plan Sponsor. Advisors are able to view summary plan balances of all their plans on the 401k Easy system, and view the specifics of each plan and individual participant accounts. To keep their clients informed about investments regarding the plan, the built in email message center allows the advisor to post bulletins and send/receive messages with plan sponsors and participants. Advisors can view and print detailed histories of a variety of administration reports, including contribution statements for participants, allocation logs, loan activity, liquidations, transfers, and distributions. All Plan Reports are instantly created as Adobe PDF documents for printing or archiving. The Global Audit Log - maintains a record of ALL activity performed throughout the system, including activities at the general system administration level. Advisor can search for information by client, plan, date range, plan administrator, participant, and/or transaction type. Is it legal to provide investment advice services or portfolio management services, or both, to ERISA plan participants? Yes. In fact, the U.S. Department of Labor is on record saying that it wants participants to have as much assistance as possible, and that it encourages plan sponsors to offer participants investment advice if plan sponsors determine their participants need it to make informed decisions. In addition, the DOL, Congress and the Administration have increasingly voiced strong support of investment advice for participants. Would doing nothing, in other words, not providing these services to participants, be safer from a legal perspective? Not really. We think that providing advice and/or portfolio management can actually reduce your risk as a plan sponsor. Employees who make uninformed decisions about savings and investing are less likely to be prepared for their retirements. By making advice and/or portfolio management available, you ensure that your employees have access to the help and information they need to plan for their futures, decreasing the chances of dissatisfaction and possible litigation. What is the Department of Labor's view on providing advice and/or portfolio management? Is providing investment education a sufficient way to fulfill my role as a fiduciary? Informed policymakers caution that relying on education alone is no longer enough. According to DOL's current Assistant Secretary, "[m]eaningful comprehensive investment advice is more important now than it has ever been" and "[i]nvestment education, while important, is simply not enough." Assistant Secretary Ann L. Combs delivered this message to Congress on July 17, 2001 in connection with testimony on the subject of "Retirement Security Advice Legislation" to the Subcommittee on Employer-Employee Relations of the House Committee on Education and the Workforce.